These perfumes were sent free from Bruno Fazzolari Scents. 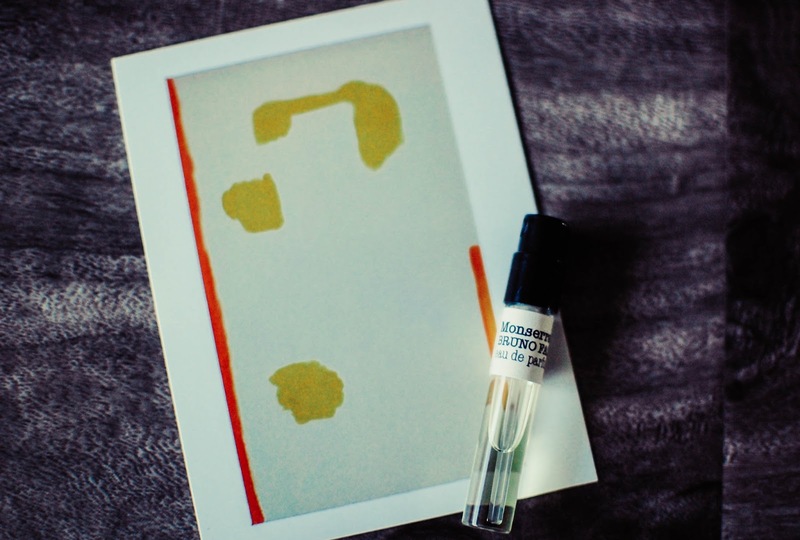 Artist, sculptor and perfumer, Bruno Fazzolari, harnesses his synesthetic scent and color pathways to craft both olfactive and visual arts. 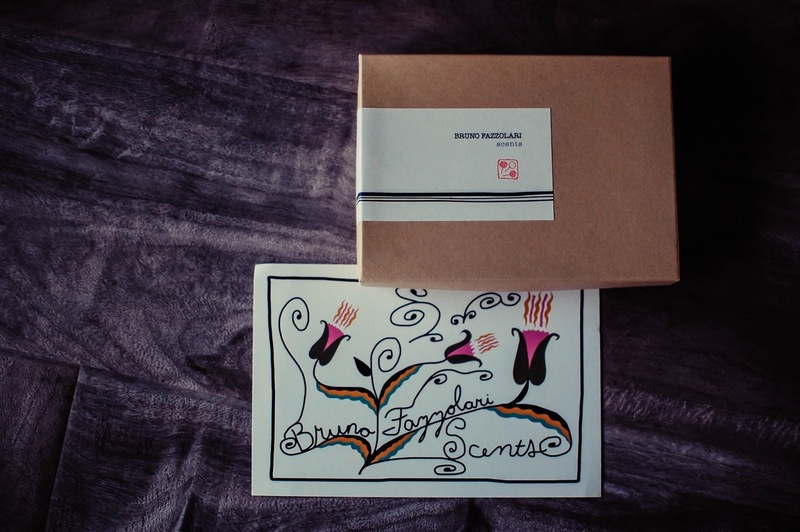 I loved the notecard that came with the samples he sent, stylized flora pushing their bouquet of scent vapors into the air. Browsing the Bruno Fazzolari curation of fragrances illuminates his modern, sharp eyed humor paired with a flavor for urbane elegance. Individual samples sell on his site for $6-$8 a piece or, even better, a Discovery Set of seven scents for $35 that includes a discount for a full bottle. I personally would go the Discovery Set route. 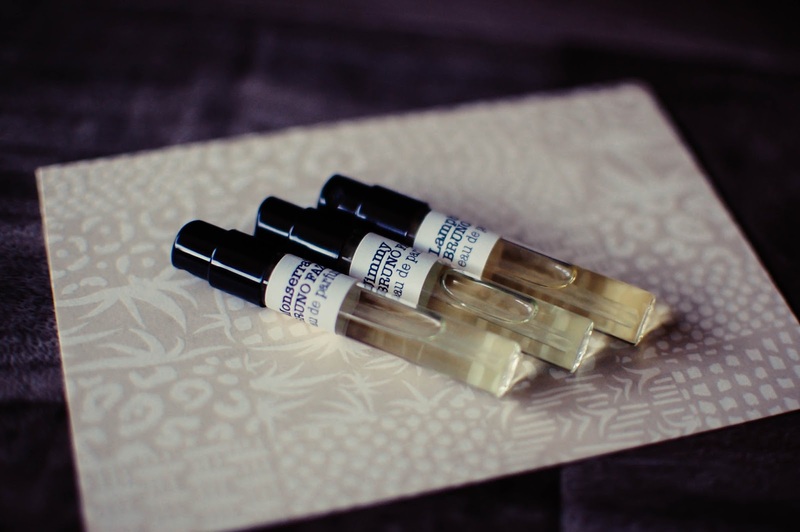 The scents arrived packaged meticulously. The branding feels artisan and indeed it is. 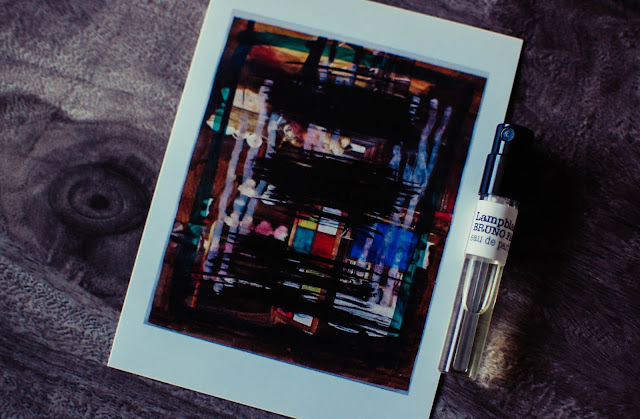 Each fragrance arrives accompanied with its own artwork with which it was created, utilizing his previously mentioned synesthesia. Exquisite ingredients, many natural, and all composed by hand. 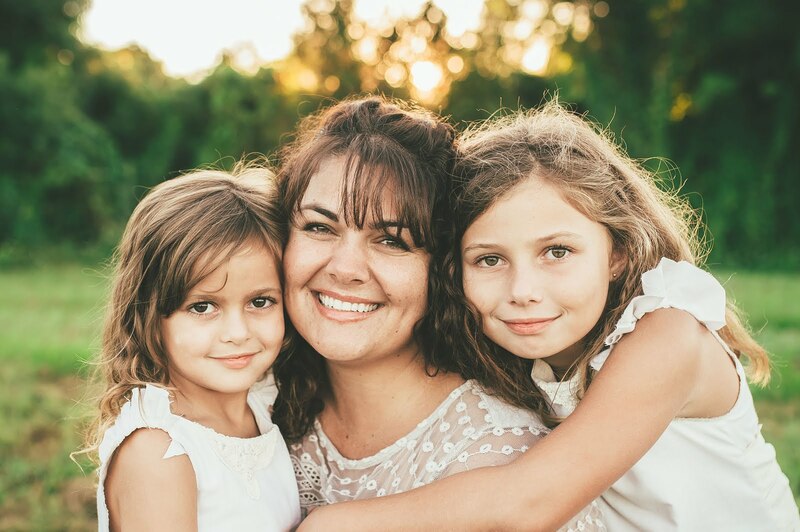 This is what niche and artisan fragrance is all about. Lampblack- Notes: Sweet orange, black pepper, bitter grapefruit, nagarmotha, benzoin, vetiver, shadow. Piquant pepper rubs hot on the skin with a whiff of sour grapefruit pith. A bow drill fire wafting under my nose: friction, black soot rubbing a singe into the flesh, a lock of smoke curling around the wrist. Benzoin and vetiver creep in like a fog to rub soft the edges of black fire and prevent it from turning acrid, lending a mildly sweet hay note. I am deeply in love with this scent. It is sultry and dark. Black gesso and glowing embers. Monserrat- Notes: Pink grapefruit, green leaves, carrot seed, osmanthus, jasmine, white musk, setting plaster. Energy and movement, vibrance from the tartly sweet pink grapefruit and bulbous iris and root flavored carrot seeds flow into sweet osmanthus and jasmine buds strung like beads on strings of cool celery threads of phloem and xylem. From verve and vim to diaphanous and delicate. A painting fading through the ages. 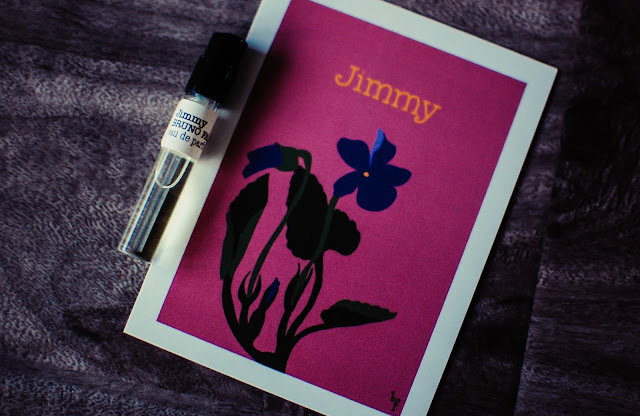 Jimmy- Notes: Ylang ylang, cassis, rose, violet leaf, heliotrope, sandalwood, daylight. Other worldly violets that straddle the line between lunar blooms and candy sweet petals to melt on the tongue. Violet jam. Plummy and sweet. Violet stars stitched into dreams, dulcet and glowing. One of the most delicious and unique violet-centric scents. I will need more of this one. 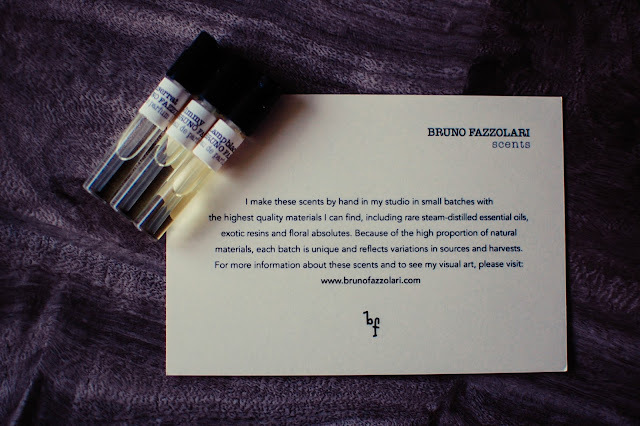 I am thoroughly impressed with these three scents from Bruno Fazzolari Scents and will be back for more.